To help dealers create campaigns and improve their results, and ensure better standardization according to Audi global identity, we developed Audi Studio. 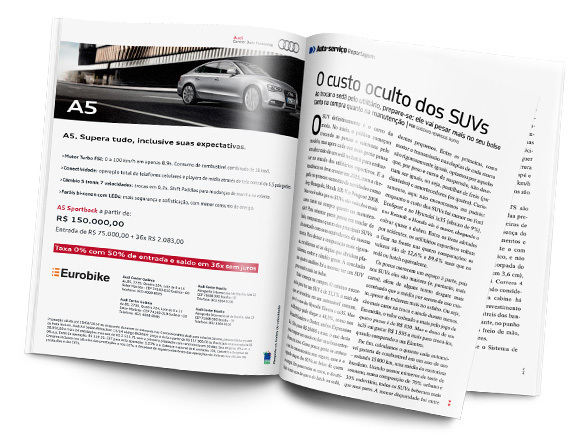 This digital platform offers several customizable ad templates, making life easier for dealers and Audi Brazil team themselves. Now tell me about useful communication! 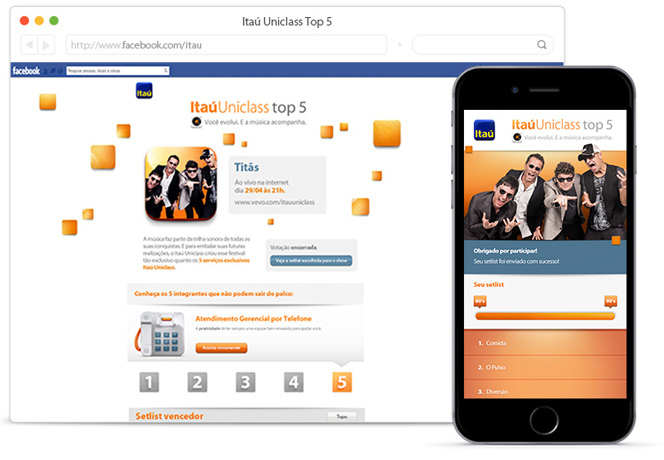 Itaú needed to promote buzz about Uniclass, the segment between retail banking and the premium Personnalité label. 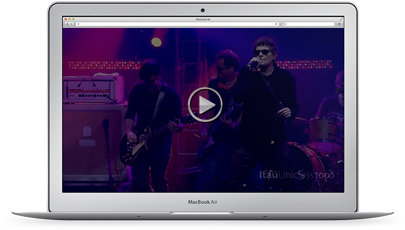 To highlight its five distinctive services, we created a communications platform in the form of a music festival. Customers had many interaction opportunities across Facebook, mobile and the web: they chose which bands would play, the set lists, talked with artists online and watched the concerts live via an exclusive broadcast for Uniclass customers. The concert featured many different hit songs and five bands selected by the customers themselves: Capital Inicial, Jota Quest, Frejat, Nando Reis and Paralamas do Sucesso. This was promoted with an integrated media strategy, Facebook posts and email marketing. In partnership with It’s Noon, a crowdfunding and crowdsourcing platform, we created a campaign inspired by “Animal Farm” (George Orwell’s classic) called The Pigs’ Revolution. The play on words here was to use pigs, a symbol for capitalism, to raise ideas rather than funds. 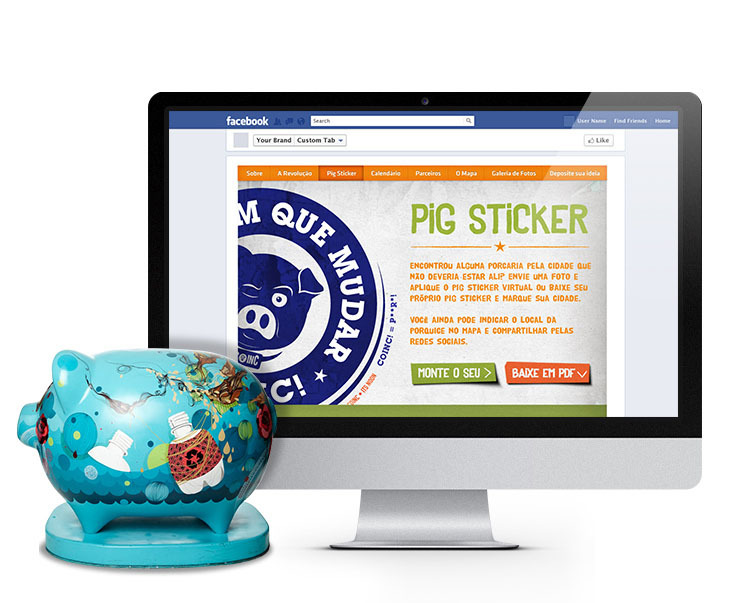 We spread giant “piggy banks” around São Paulo where people could deposit ideas about how to improve the city – which they could also submit via social media. The piggy banks were customized by local artists and then put up to auction. The total amount raised was used to sponsor the implementation of one of the suggestions: revitalizing a public park in the city’s west district. In the end, the ideas were all compiled and delivered to the São Paulo City and State governments. 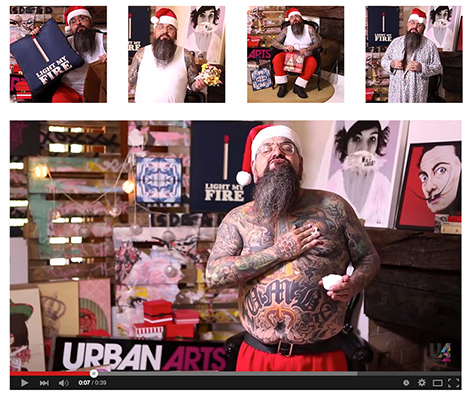 Urban Arts, an utterly unique digital art gallery, could not have a traditional Christmas campaign. Its essence is the creativity, transgression and freedom inherent in art. To challenge its customers to have a unique and unpredictable holiday season, we created #NatalUAU (#ChristmasWOW), a very fun experience hosted by a Mysterious Elf, our own “ghost of Christmas. 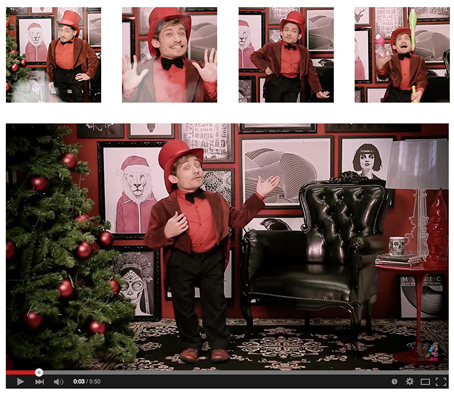 With short and unpredictable videos for Instagram and Facebook, our elf invited customers to celebrate a unique Christmas and suggested a lot of art they could give friends and family. The true spirit of #NatalUAU by Urban Arts. In 2014 we created the first Christmas campaign for Urban Arts, Brazil’s most unique and contemporary digital art gallery. We needed to think outside the box and draw attention, in the midst of all the holiday hype, to a new gift option: digital art. Nothing could be better than HoHoHell Christmas, starring a Santa Claus who was anything but conservative, “jolly,” or “old”: “Pere NoHell”. In a Facebook fan page, people shared their worst experiences involving Christmas gifts. The best stories served as inspiration for the videos, in which Pere NoHell joked sarcastically about that particular type of gift. In addition, Pere NoHell gave real-time tips on how to prevent Christmas blunders in a special web series and online chats. 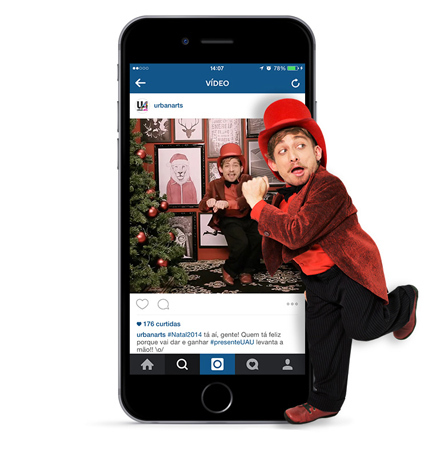 For the chain of physical stores, we created POS materials like stickers, mobiles and a life-sized Pere NoHell, with whom customers took pictures and posted on social media.